Why I read this book: If you've been here awhile, I love language books. If you are wondering what this book is about, all you really have to do is look at the title. This books is about What Language Is, What it isn't and .. well how it got that way. Or at least an interesting look at how it got that way. 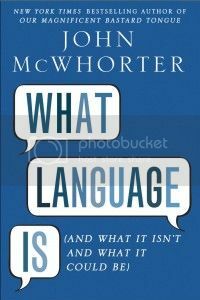 McWhorter takes a look at language (not just English though that is the prime example) and exploits each language's idiosyncrasies. I really enjoyed how the book was structured to look at different aspects through the use of the word "idiom" So throughout the book you get to see how language is ingrown, dissheveled, intricate, oral and mixed. He delves into to the detail of each, give nice visual examples (yay!) to help guide through the strange twisted path that languages take to get where they are now. Sometimes it can be a little rough to follow in a my cousin's sister-in-law's mother's aunt sort of way, but I cant really falt him too much for that. Because that is how langauges are. I particularly enjoyed to comparisons to Mandarin (a laguage I studied as an adult and thus have read a good deal about) and the disshevled section. The examples were gripping for me. The thing is, I am not a linguist. I just enjoy casually learning about language. If in any part of this book that joy of learning was overshaddowed (it happened a few, but not too many times) I just skipped ahead. It still worked and it was still an enjoyable book. Will you like this book? Well, I have a question for you. Do you enjoy origins of laguages? Are you curious to read more about why its finger with a hard g and singer without? Then I would say you should give this book a go. It is interesting and I learned a lot without it being too textbooky. I am also allowed to give away one copy of What Language Is (US and Canada Only). All you have to do is enter here and I will chose the winner in one week's time. Thanks to TLC Book Tours for giving me the chance to read this book. Another book for my wish list! This definitely sounds like a book that I would really enjoy reading. I'm glad you found it interesting - I know I'd definitely enjoy it!